Our very own CCFC Instructor GM Mikheil Kekelidze is the 2012 CCFC Club Champion! Congratulations to him on his fine clear 1st place performance, topping a field that included 1 other GM, 2 IMs, and a host of masters, experts, and class A players! 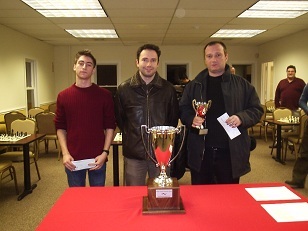 Finishing in joint 2-3 were GM Eugene Perelshteyn and Alexander Ostrovskiy. Clear 1st place in the U1800 section went to CCFC regular Noah Arthurs who finished with an incredible perfect 5/5 score! Games coming soon!